Born Francis Possenti in Assisi, Italy, on March 1, 1838; died on February 27, 1862 and canonized in 1920. After an adolescence focused on debauchery, he fell ill and vowed to enter religious life if he was healed. He was restored and entered the Passionist Order in 1856. He lived his religious life faithfully including penances, daily prayer and a joyfulness of spirit. He was ordained to the priesthood but immediately afterward contracted tuberculosis and died at age 24. Through his intercession St. Gemma Galgani was cured of spinal tuberculosis. Gabriel is the patron saint of students and we celebrate his feast day on February 27th. 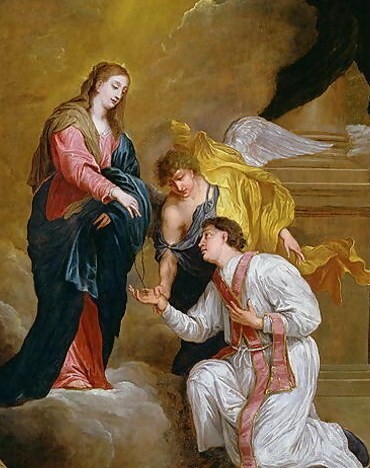 St. Valentine of Terni (a city also known as Interamna) was a young noble who converted to Christianity. 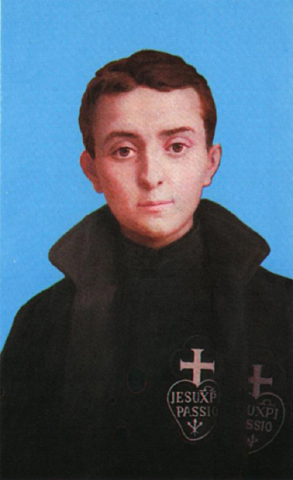 He became a bishop at a young age, and died a martyr at the age of 97. Born in Terni in 176, he was martyred in Rome on February 14, 273. He was persecuted for having encouraged marriages between Romans and Christians. During his trial he discussed his faith with his judge. The judge Asterius put his Faith to the test. The judge presented Valentine with his blind daughter, who was healed. Asterius destroyed the idols in his house and had his whole family and household of 44 members baptized. He then freed all Christian inmates under his charge. Valentine was arrested again for attempting to convert the heathen. He was tortured and martyred. Archaeologists have unearthed both Roman catacombs and an ancient church dedicated to St. Valentine. In 496 AD Pope Gelasius marked February 14th as a celebration in honor of his martyrdom. The connection between the secular celebrations and his day probably have two contributing factors. St. Valentine’s feast day coincides with the Lupercalia, an ancient Roman festival dedicated to fertility, which Pope Gelasius abolished in 496. This connection also got a boost in the Middle Ages when it was believed that birds paired couples half way through the second month of the year. St. Valentine is the Patron Saint of bee keepers, engaged couples, epilepsy, fainting, greetings, happy marriages, love, lovers, and young people. Grant, we beseech thee, O Almighty God, that we who keep the birthday of thy blessed Martyr Valentine may be delivered by his prayers from all the ills that hang over us. Born Alessandra Lucrezia Romola on April 23rd, 1522, in Florence, St. Catherine entered The Third Order Dominicans. She entered the novitiate, in 1535 at the age of fourteen (taking the name of Catherine), and professed in 1536. She lived a life of penance and mortifications, fasting two or three days a week on bread and water, and sometimes passed the whole day without food. She mortified her body with a sharp iron chain which she wore next her skin. She is most remembered for her mystical life and weekly ecstasy. The great “Ecstasy of the Passion”, happened for the first time in February, 1542, and repeated each week afterwards for twelve years from Thursday at noon till 4 p.m. on Friday, for several years. She went through all the stages of Our Lord’s Passion, recounting all that His Blessed Mother suffered in witnessing it. These ecstasies ceased in answer to the prayers of both Catherine and her community. Catherine received the stigmata, the very wounds of Our Lord, on her hands, feet, side, and around her head. On Easter Sunday in 1542, she was visited by Our Lord, and He gave her a gold ring with a diamond in it as a sign that she belonged to him. To the world, her finger appeared to have a hard ring just below the surface of her skin. Catherine saw and experienced it as a physical gold ring. Catherine was chosen, at a very young age to be mistress of the novices, then sub-prioress, and, at the age of twenty-five was appointed perpetual prioress. Her community still exists and inhabits the convent of San Vincenzio (now commonly called Santa Caterina), and there her body still reposes. Her feast is kept on the 13th of February. Adapted from the Catholic Encyclopedia, and Vol. II of “The Lives or the Fathers, Martyrs and Other Principal Saints” by the Rev. Alban Butler, the 1864 edition published by D. & J. Sadlier, & Company. Almighty God, you brought Catherine to holiness through her contemplation of your Son’s passion and the sorrows of Our Blessed Mother. She gave us an example of a life of penance and heroic virtue. Through her intercession, help us to become courageous witnesses and teachers of these mysteries. We ask this through our Lord Jesus Christ, you Son, who lives and reigns with you and the Holy Spirit, one God, for ever and ever. Amen.